Borders are inherently funny. Many times, they're like what my sister used to do on long car trips, when she'd run her hand down a shared car seat and tell my brother and I that we were not to cross some kind of imaginary line she'd created. Earlier this year, Coca-Cola had a very cute commercial spoofing the same kind of behavior between two imaginary nations. If you haven't seen it, you can watch it HERE. Sometimes even real borders have a certain funniness to them. For example, the Peace Arch at the US-Canadian border between Washington State and British Columbia. The road goes around the arch instead of through it and the gates inside the arch are immovably affixed to the interior walls. Symbolic of course. Then you get to a real gate with barricades, guards, guns and stuff. 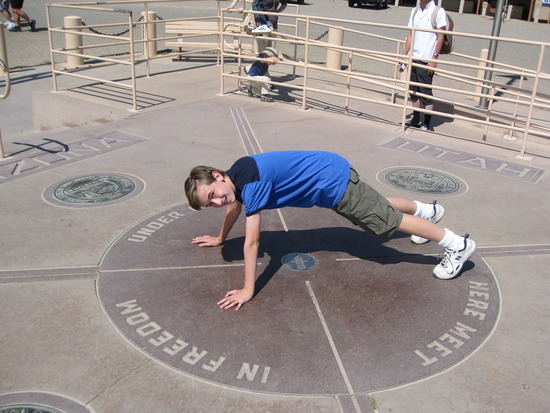 One of the funniest borders I've ever seen is the Four Corners Monument which lies in the middle of Navajo land at the intersection of Utah, Colorado, Arizona, and New Mexico. There's a raised platform where the spot is marked. The whole area is surrounded by Indian trinket vendor booths selling turquoise jewelry and arrowheads. 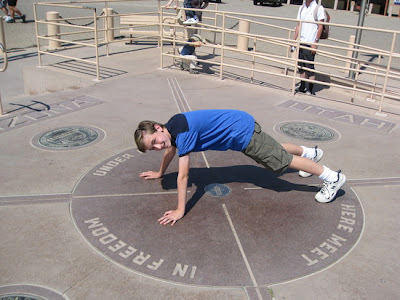 In the center, there are mostly white folks contorting and prostrating themselves to to have the honor of being able to tell people that they were in four states at the same time. If I were an Indian I'd be constantly asking myself, "How did we ever lose to these people?" Then of course there are the less funny borders. Like the Berlin Wall. 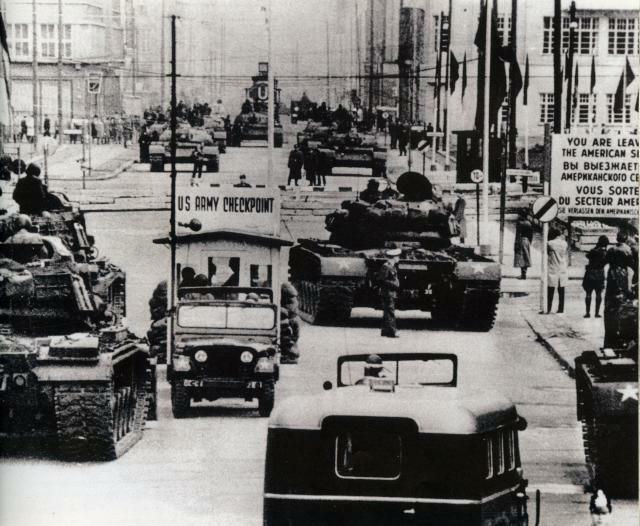 The photo above is from the tank standoff in October 1961 between the Soviet and American forces. Curiously, it all began over a dispute regarding an American diplomat wanting to see an opera in East Berlin. Seriously. 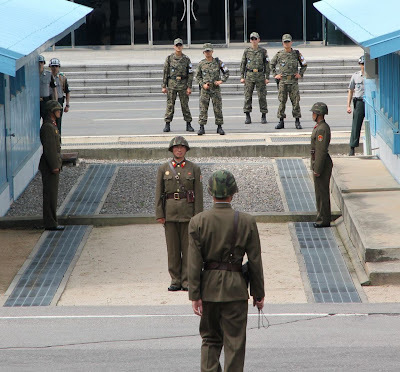 Of course there are still plenty of unfunny borders around today, like the Korean border. 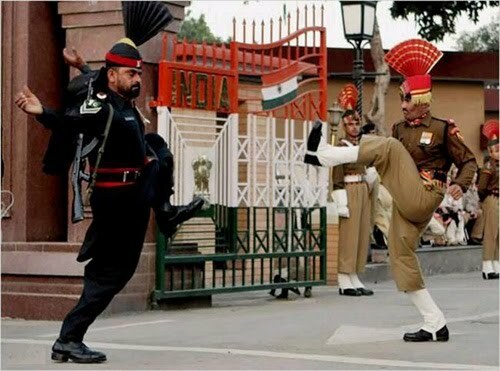 Now thats some fancy footwork! I learned how to march and stuff when I was in the service. I'm glad we have a bit more conservative approach here. That was too funny! At least it ends in a handshake. Nice to have you back, Nate. 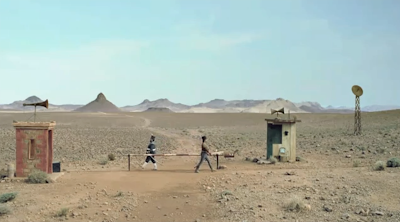 Have you been traveling to the 4 Corners? Back in the day, that spot used to be a dust-covered parking lot. And free. Now, I've heard, you have to pay to stand there? Judi, nothing so interesting. I took a trip to Los Angeles to help out a friend of mine and then when I got home I upgraded my computer. 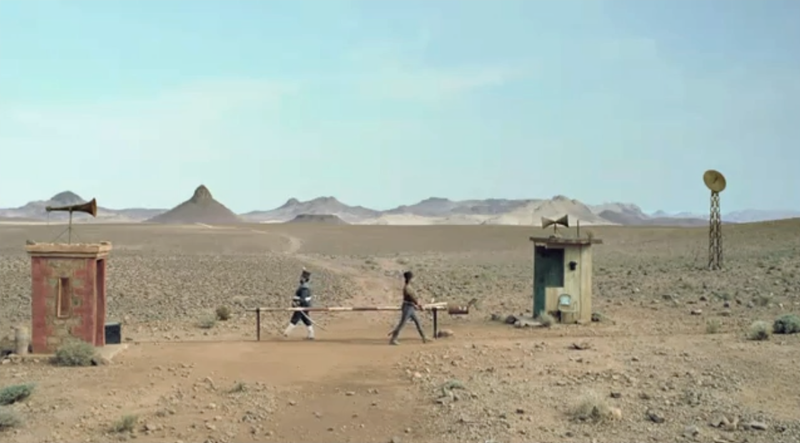 I have been to Four Corners back when it was less fancy and free. That part of the country is unique. We thought it interesting that there was a Federal Highway 666 that ran nearby. Someone told me that a few years ago they renumbered it US-491. There is an interesting border at Lake Tahoe. The CalNeva hotel is built on the state line. The hotel has a line through the lobby, the pool, etc separating the states of California and Nevada. Of course, if you go to the Nevada side of the lobby you can gamble. It is an old hotel with lots of character. The famous (or infamous) "Rat Pack" with Dean Martin, Frank Sinatra, etc. used to stay there to 'play'. You can stay in the cottage that Marilyn Monroe always stayed in. The 4-corners must be really an interesting point. In Europe there are also 2 points with 4-corners, but divided between 2 countries: at Baarle Hertog/Baarle Nassau (2 corners in Belgium and 2 corners in the Netherlands) and at Jungholz (2 corners in Germany + 2 corners in Austria). I'd feel honoured if You visit my borders' blog. Comments welcomed. I know this is an older post, but I happened upon it this morning. You can file this under "cool borders"
How did we lose to these people? How did we lose to Whitey? You are not a racist if you hate Whitey. One earth, one people. Get over yourself. Nice post. It is so much fun to attend Wagah border ceremony, one gets the true feel of patriotism and the ceremony fills you with lot of enthusiasm. 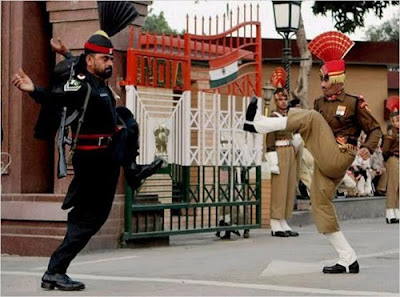 Click here to know more about Wagah border.